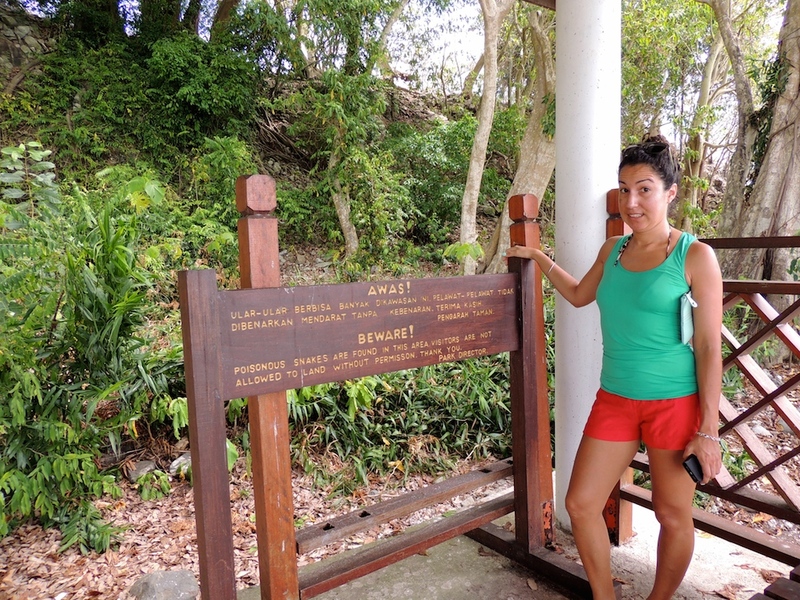 Surviving Survivor Island: Pulau Tiga – These Two Eyes! The instructions were simple. Walk with a friend and a monkey won’t assault you. At night, carry a flashlight so you don’t step on a snake. It’s called Survivor Island for a reason, right? Over a below average lunch buffet of chicken bones cooked in curry, steamed vegetables and rice, I dropped my chopsticks mid-bite. A 4-foot long monitor lizard was casually walking across the grass just outside the pavilion. Later that night while playing a game of cards under the same pavilion a local wandered over and asked if we wanted to see a snake. Coiled around his arms he held a mid-size yellow ring snake that he just caught out back. Luckily I brought my bike light with me to safely navigate my way back to our cabin. Just as we approached, fist-sized crabs and large rats scurried away from the shining light into large deep holes at the base of the steps leading to our accommodation. We played a few more rounds of cards using mangrove leaves as poker chips while drinking Tiger beers to forget the proximity of the wild as we were also encouraged to ensure our window screens and doors were securely locked. Pulau Tiga is a small, uninhabited island off of the west coast of Borneo, Malaysia in the South China Sea. 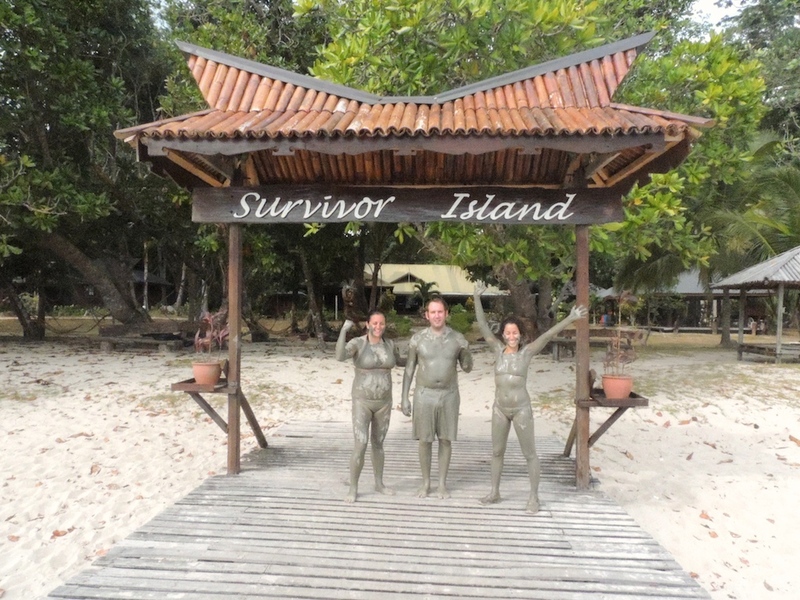 As the first place to host the reality TV show Survivor, it’s commonly nicknamed Survivor Island. Surprisingly, there was no cheesy décor or leftover remnants of the year 2000 at Survivor Island Resort. In fact, for our one night stay on the island it was conveniently just us and two other families. That meant we had first dibs on exclusive empty beaches, food, snorkeling and breathtaking sunsets. Upon arrival we eagerly lazed around on rope hammocks underneath thatched roofs made from the palm trees. Not too bad for being on a remote island. At 3 o’clock we joined a local guide for a 20 minute hike into the forest to experience a natural mud volcano. After walking uphill on a dirt path, eyes carefully scanning the forest for monkeys or any other natural ‘friend’, we finally arrived at what looked simply like a small pool of mud. Bubbles boiled while mosquito-like bugs the size of a quarter layered the top, casually hopping over each other to fill any gaps. Without thought, the middle-aged Dad from the French family we hiked along with took his shirt off and walked right into the dark goo followed by his 7-year-old daughter. I mean, it was the sole purpose of journey so why hesitate? “Is it cold?” “What does it feel like?” “Is it deep?” I watched my travel buddies Ben and Nidya get in next. I still wasn’t convinced but it had to be done. Gulp. One foot after the other I slid into the slippery mess. It was thick and putrid. I envisioned it being soft like melting into a milkshake but in reality it was just mud. Heavy, with leafs and twigs engulfed in its concentrated mass. The bottom was like walking through a swamp, sinking with no firm bottom. My thoughts went to leaches. So there we were. The three of us caked in mud, hesitant to submerge our top halves in any further. Our guide was encouraging as he snapped photos, suggesting to put it on our face and float in its density. Pictures snapped? Okay, I want out. That was the tricky part as it was deep and slimy. Even trickier was hiking downhill through the jungle with bare feet wearing nothing but a bathing suit as the rancid mud dried all over my body and face. With relief we arrived at the ocean and spent the next half hour wallowing in its warmth while cleansing ourselves of the crust. I do say however, it did wonders for my skin. Wink wink. The following day we opted for a tour out to Snake Island. This simply consisted of us traveling about 15 minutes by boat to a small deserted island where highly venomous Yellow-lipped Sea Kraits or Banded Sea Kraits live between rocks and the sea. Before entering the dirt path our guide pointed to a sign stating that we are entering at our own risk into an area with poisonous snakes. One bite and you are dead within 5 minutes. This is when I started to have doubts. As we wound around to the side of the island, we began to climb over large boulders. The guide was further ahead, ducking his head around and underneath the rocks. It then occurred to us, he was looking for the snakes! That meant they could be anywhere! Um, I don’t think I need to go any further. My friends marched ahead, skipping from each boulder to the next to catch up with our guide. As they got further away and I stood alone on top of a large rock I started to wonder if it was smart for me to now be all alone. Both the guide and Nidya urged me on, and came to lend a hand so I could join the group. They had found the snakes, a handful of them lay coiled together underneath a large rock where the ocean met the land. 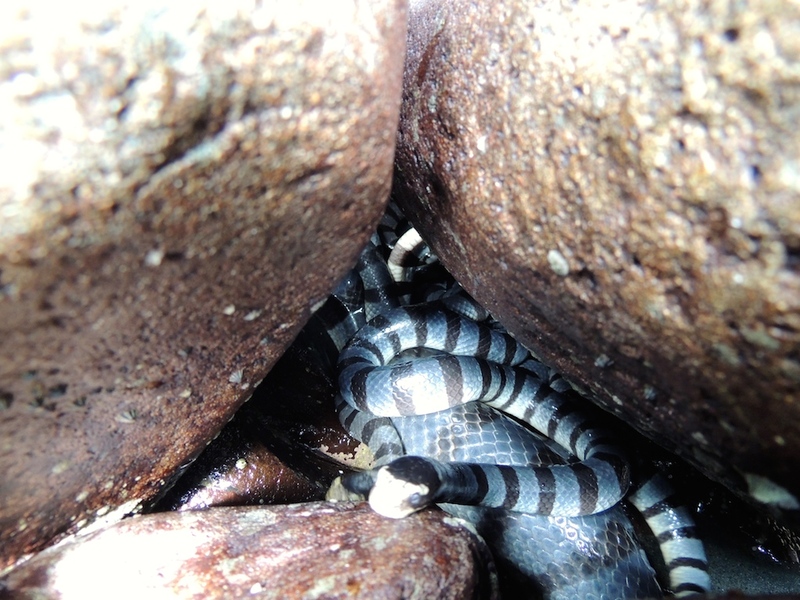 It was enough to take a quick peek at the small, silvery serpents before rushing back to the safety of our boat. We were lucky that day to witness a pod of dolphins dancing around our boat which provided an amusing spectacle. The island just next door was Sand Spit Island, a long stretch of golden sand that appeared as if it thrown up from the sea. Getting a closer glimpse while walking along it’s shore, which you can cross the width in a few long strides, it was disappointing to see all the plastic bottles and trash that covered it. Shortly afterward we docked in the clear blue sea to have a snorkel. While aspects of the reef were damaged we still experienced an array of bright, neon fish of all shapes and sizes, including angel, clown and of course, Nemo. Our guide was really awesome and attentive, pointing out fish as he swam along with us but unfortunately we didn’t get to see any sea turtles that day. When it came time to pack up and leave Survivor Island, despite an amazing time of sun and adventure, I was ready to move on. I was done with bad food and questionable toilets although happily impressed with the staff. If you’re okay to scrape by without the luxury of a boutique resort, this is for you. It’s simple and different, and if I had do it all over again I have no regrets of experiencing something so unique. Did you find Richard Hatch’s shorts? Or a hidden immunity idol? Haha, I never even watched Survivor so don’t know. But really, you would have never known a TV show was even filmed there.